A new collection of essays edited by Professors Panos Koutrakos, Niamh Nic Shuibhne and Phil Syrpis assesses the law and practice of exceptions from the principle of free movement. The City Law School’s Professor Panos Koutrakos, Professor of EU Law and Jean Monnet Professor of EU Law, has co-edited a new book of essays about EU Free Movement Law with the University of Edinburgh’s Professor Niamh Nic Shuibhne and the University of Bristol’s Professor Phil Syrpis. 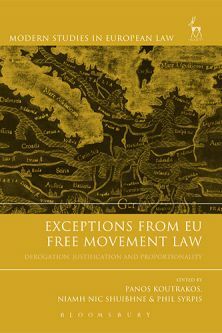 Exceptions from EU Free Movement Law – Derogation, Justification and Proportionality, published by Hart Publishing (an imprint of Bloomsbury Publishing), sets out to: Conceptualise how justification arguments regarding exceptions to free movement operate in the case law of national courts and the Court of Justice of the European Union; Develop a comprehensive and original account of the empirical problems on the application of proportionality; and, Explore the legal and policy issues shaping the interactions between the EU and national authorities, including national courts, against the background of efforts made by the Member States to protect national differences. 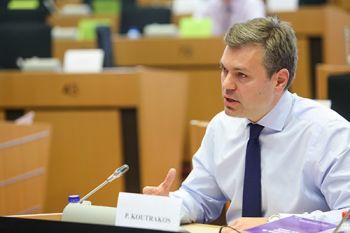 He goes on to say that regarding the free movement of persons, “the debate about Brexit has raised questions about the type of restrictions that the EU may tolerate in its re-configured future relationship with the UK”. The book examines free movement of persons in various chapters, including those on citizenship by Professor Eleanor Spaventa, on welfare quality and students by Sara Iglesias Sanchez and Dr Diego Acosta, on public policy by Professor Daniel Thym, on public security by Professor Koutrakos, on EU secondary legislation by Professor Phil Syrpis, and on the post-Lisbon climate by Professor Niamh Nic Shuibhne.